It's that time of year to make resolutions to improve the success of your law practice. Below are a year's worth of resolutions (not necessarily in any particular order). Your financial plan should be a cash flow statement, including the firm's revenue, the firm's projected expenses, and a summary of the two. A website can be a great marketing tool to engage and impress current and prospective clients. Social media constitutes a powerful marketing tool for lawyers. Show clients that you care about them. In terms of insurance, carefully consider the likelihood of occurrence compared to the cost. Banks use your average daily balance to analyze a loan request. Thus, maintain as high a balance as possible. Although rent is normally fixed, it can become variable during times of economic difficulty. Determining your revenue is important for future success. Is it time to reconsider your pricing system to make your services more attractive to potential clients? Bills serve as an important marketing tool if used correctly. A narrative billing statement communicates what you have done to justify your fee. Some steps you can take to decrease the need to worry about collections include discussing your fee and establishing a budget with the client before beginning an engagement, increasing your retainer, and timing your statements to arrive after a satisfying event in the case. Hiring a part-time executive director is one way that a solo or small firm can better manage the practice, deliver higher-quality legal services, and make more money doing it. 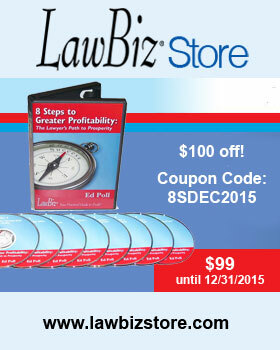 Ed Poll, a legal coach at LawBiz, can help you and your law firm every step of the way. For more information on legal coaching, click here. "Ed's command of the podium and his connection and interaction with the audience were outstanding. His skills enabled us to successfully implement a new culture into the organization without damaging our relationships with outside counsel." "When I had my own private practice as a solo practitioner, I wanted to run my office as efficiently and profitably as possible. I researched business coaches and discovered that most had "passive" models as their basis for coaching, i.e. they would promise all the things they would do for my practice without my having to invest time and energy into the process. I'm so glad I chose Ed Poll instead, for he had an "active" model, i.e. how much I got out of the coaching was directly dependent upon what I put into it. Over a period of six months, Ed conferenced with me and gave me weekly assignments for structuring my practice as well as giving me tips on how to work with clients from the initial interview through to the end of the case. After working with Ed, I didn't have a single outstanding account receivable over $500. The time I spent working with Ed was invaluable and I would recommend him to any attorneys interested in improving the quality and profitability of their practices."